There are many nice food in Sarawak. Hardly get a similar ones here in Penisular Malaysia. One of my favorite is Red Rice Wine Mee Suah. Hubby is a Foo Chow. Therefore each time we balik kampung, mother in law will sure to cook red rice wine mee suah, which I enjoyed the most! Mee Suah is their specialty when it comes to any auspicious day. Eg: Birthdays, Chinese New Year & Weddings. When Hubby went back Sarawak last month, I asked him to buy me some ‘mee suah’ and ‘red rice wine’. Both mee suah and wine are homemade. Read how they made the mee suah HERE. Sometime ago, mother in law has briefly taught me the cooking method. 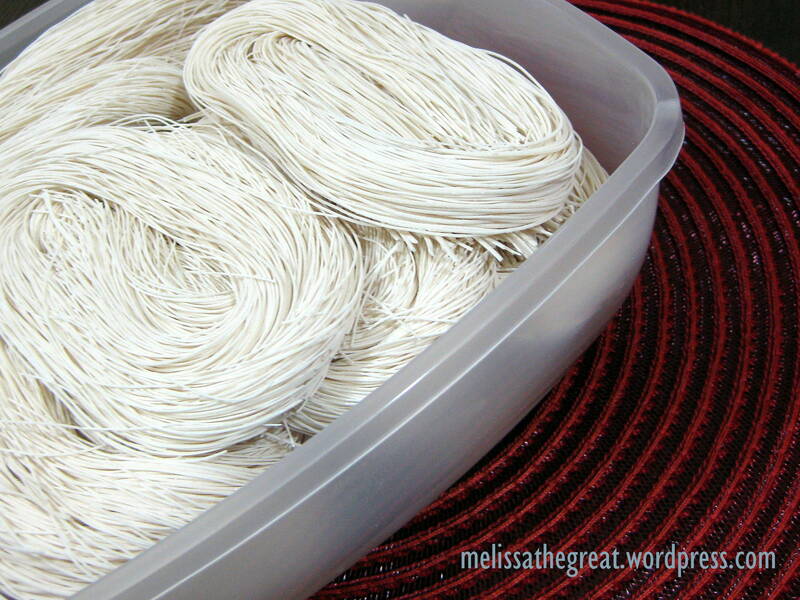 Pieces of beautiful white thin strand mee suah. I successfully made a bowl of warm and hearty Foochow Red Rice Wine Mee Suah. (With 2 hard boiled eggs for Hubby.) I particularly love their mee suah very much. Its so SMOOTH and thin. If no teeth oso can eat. No need to chew. Just swallow. hahaha…Apparently Hubby commented that it tasted similar to his mom’s version. That means GOOD?? Compliment?? Marinade the chicken pieces with the oyster sauce, soy sauce and a bit of pepper for at least half an hour. Add the marinated chicken pieces to the ginger and stir fry to brown the chicken pieces. If you are using black fungus you will add it at this point. When chicken is browned (The meat is opaque and brown in parts) add some water to cover the chicken and cover the wok/pan. Bring to a boil then let it simmer for about 10-15 minutes. Taste and add salt or soy sauce to taste. When chicken is cooked, add about 1/4 of a bottle of the rice wine and 1 tbsp of Shaoxing Chiu. Stir quickly through and turn off the fire. Wash the mee suah pieces in a bowl of cold water to remove the starch. Boil up water separately in a pot and add the mee suah pieces when the water is boiling. Using a pair of chopsticks, separate the noodles as they cook so they don’t lump together. Bring water to a boil for about 2 minutes then turn off and pour away the water. Place the vermicelli in a bowl. Ladle the chicken pieces and soup over the noodles. Garnish with the ginger slices you set aside earlier. Sarawak Foochow Red Rice Wine Mee Suah is different from Sitiawan one. Sitiawan one they don’t have egg and mushroom as ingredient. jobless – Sitiawan Foo Chow uses Black Fungus isit? No wor, only chicken, ginger and red rice wine. i seldom eat mee suah ….. but it doesn’t look red ….. why? Simple person – LOL! 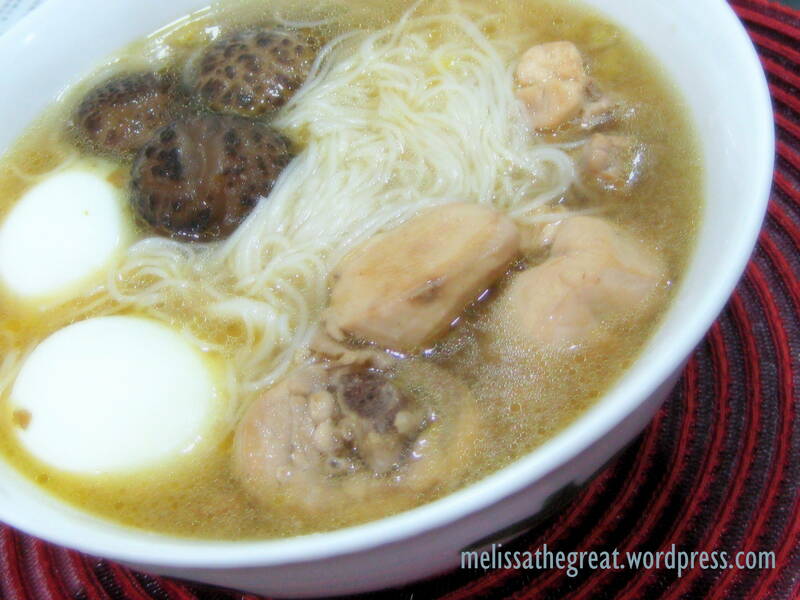 hahaha…no particular reasons ger la…Usually birthday oso will eat eggs…so, this mee suah oso with egg lo. HB said he wants 2 biji ma…About the redness…mayb the when the person makes the wine..he/she didn’t put alot of ‘dry fermented red rice’. well, doesnt matter if its not colored red, as long as it taste good! Food Dreams – Yay…High 5!! btw…you are Foo Chow too?? Ms Melissa I plan to cook hong zhao mian xian but I am confuse about the ingredient … some told me I need to use hong zhao paste and some said just the wine will do… But I am ain’t sure should I get the paste or just the wine? or either one can use? Here’s the difference of with and without hong zhao paste.